When you walk down the cereal aisle of your favorite supermarket, it's easy to get overwhelmed very quickly. There are hundreds of different varieties, each one offering a variety of benefits ranging from great taste to nutritional claims to special prizes and toys. While not everyone agrees on which cereal brands are the best, there are a few tried and true selections that deserve to be included on a list of the "best of the best" in this product category. Cheerios is a great tasting cereal that has long been popular with children and adults alike. According to General Mills, the brand's manufacturer, Cheerios was introduced to the market in the 1940s, became the company's top seller in the 1950s and became the top-selling cereal in the United States in 2003. Babies are started on this cereal as soon as they can chew a little and it is a staple with moms everywhere. Cheerios were even chosen by Cooking Light magazine as the best cereal for kids. 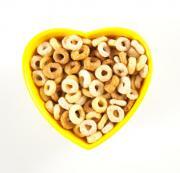 In addition to having a great flavor, Cheerios cereal is naturally cholesterol-free and low in saturated fat. This fact makes it a popular cereal choice for adults who are interested in following an eating plan focused on heart health. In 2011, Quaker's Life cereal celebrated its 50th anniversary. The cereal became widely recognized as one of the first good-for-you cereals with a flavor that kids also love during the 1970s, when the cereal's manufacturer launched the catchy "Mikey likes it!" series of television commercials. Life remains popular with modern consumers even after more than 50 years on the market. It was named the best rolled oats cereal by Real Simple magazine, with testers describing the cereal as one that strikes a "tasty balance of salty and sweet." Offered by General Mills, Lucky Charms is a sugary cereal with little marshmallow puffs. While it won't win recognition as one of the healthiest cereals on the market, the "magically delicious" treat is a long-time favorite with kids and some adults. The cereal's popularity and brand recognition is due, in part, to its well-loved Lucky the Leprechaun mascot character, selected to represent the brand in 1963. Lucky Charms is listed at the top of Maxim magazine's list of the 100 best cereals, with reviewers citing the benefits of starting the day off with a tummy full of good luck charms (clovers and horseshoes in your tummy), paired with the cereal's delicious sugary taste. If you're looking for a more grown-up cereal choice, you just might find Kashi Go Lean to be one of the best selections that meets your nutritional needs. It comes in several varieties, with Kashi Go Lean Crisp! Toasted Berry Crumble being included on WebMD's list of the ten best new healthy breakfast cereals. The Kashi Go Lean brand is listed as the best high-fiber, low-fat cereal by Real Simple magazine. Testers who selected products for the Real Simple list of cereal recommendations tried a variety of products with similar nutritional value and selected Kashi Go Lean as the most "hearty and delicious" option. Frosted Flakes has led the Kellogg's product mix as the manufacturer's best-selling cold cereal brand since it was first introduced in 1952, leading it to be listed on the list of all-time best-selling breakfast cereals published by Country Living magazine. America's love affair with Frosted Flakes has endured over the decades, thanks in part to the flavor assurances of beloved character Tony the Tiger. Frosted Flakes is listed at the top of the all-time favorite cereal list published on Ranker.com. Of course, as site visitors vote on their own favorites, rankings may change - but this tasty cereal is likely to continue to occupy the top spot - or one very near to it, for many years to come. Made by Attune Foods, Uncle Sam cereal has been on the market since 1908, making it one of the oldest commercially-available cold cereal brands. Made with a combination of flax seeds and winter wheat berries, this brand is designed to be a high-fiber, diet-friendly option that is widely recognized for heart-health and weight management benefits, as part of an overall diet program. When the South Beach Diet was introduced in 2003, Uncle Sam cereal was specifically recommended as a meal choice for two of the daily meal plans included by Dr. Arthur Agatston developer of the South Beach Diet. It has been recommended for several other low-glycemic weight loss plans, inlcuding the F Factor Diet, The Snack Factor Diet and more. If you're looking to lose weight or want increase your fiber intake for other health-related reasons, Fiber One Original cereal just might be your best choice. With just 60 calories, a single serving provides 14 grams of fiber with no added sugar. According to Mens' Health magazine, Fiber One Original is the best cereal to eat. Not everyone chooses their favorite cereal based on health benefits. For many, flavor is still the deciding factor. In October 2012, The Huffington Post conducted an independent, double-blind taste test featuring 12 popular and well-known sugary cereals. Golden Grahams came out in the number one position, ranking even higher than classic kids' favorites like Cap'n Crunch and Cinnamon Toast Crunch. Fortunately, according to manufacturer General Mills, there is more to Golden Grahams than sweet goodness. 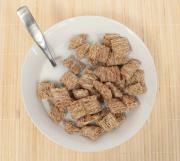 With 10 grams of sugar per serving, Golden Grahams has less sugar than many other kids' cereals. The cereal provides 11 grams of whole grains per serving. It's also a good source of 12 essential vitamins and minerals, including vitamin D and calcium. Spoon Size Shredded Wheat is a great option for diet conscious cereal-eaters who want to enjoy a classic whole-grain favorite that tastes as great as it is good for you. Listed at the top of Woman's Day magazine's list of the ten healthiest cereals, this Post cereal packs a powerful nutrition punch. A one cup serving has six grams of protein, six grams of fiber and no sugar, with no added salt.